HAMP Modifications : Is Reset Risk an Issue? Goodman and Zhu analyze whether HAMP resets are an issue and conclude reset fears are overblown. They find that the first of the resets which will occur in the fourth quarter of 2014 are likely manageable. They expect the first substantial defaults to be in 2016 and likely to accelerate in 2017. This will be short-lived, as the number of resets and hence defaults will shrink considerably in 2018 and plunge in 2019. Goodman and Zhu estimate an increase of 10% increase in the default rate, with 40-50% of affected borrowers receiving an additional modification, suggesting a 5-6% increase in defaults at the resets. As of January 2014, more than 1.1 million homeowners had received a permanent modification of their mortgages through the government's Home Affordable Modification Program (HAMP), which began in 2009. The program was intended to help homeowners avoid foreclosure as housing prices sank and unemployment soared nationally. Under HAMP, loans were modified so that the borrowers' housing expenses were equal to 31 percent of their gross monthly income, or a 31 percent "front-end" debt-to-income (DTI) ratio. Most HAMP modifications involve interest rate reductions, and although HAMP modifications are called "permanent," most of those reduced interest rates last for only five years. Recently, concerns have been raised that HAMP interest rate resets, which begin later in 2014, could cause many borrowers to default on their modifications, thus lowering the number of program successes.1 And since many proprietary modification programs were modeled on HAMP, such concerns extend beyond HAMP. In this commentary, we look at the reset issue and demonstrate that it will manifest itself initially in 2016 and will be less severe than others have predicted. HAMP requires lenders to take a sequence of steps—called a "waterfall" and explained below—to reduce the borrowers' monthly payments to 31 percent of their gross monthly income. One of the early steps in the process is to reduce interest rates to as low as 2 percent.2 The reduced interest rate lasts for five years, after which it resets upward by up to 1 percent a year until it reaches the primary mortgage rate in effect at the time of the modification.3 For 2009 and 2010 modifications, the maximum rate is approximately 5 percent; it is lower for mortgages modified in 2011 and later years, reflecting the decline in mortgage rates. All other terms of the modification remain unchanged when the loan resets. 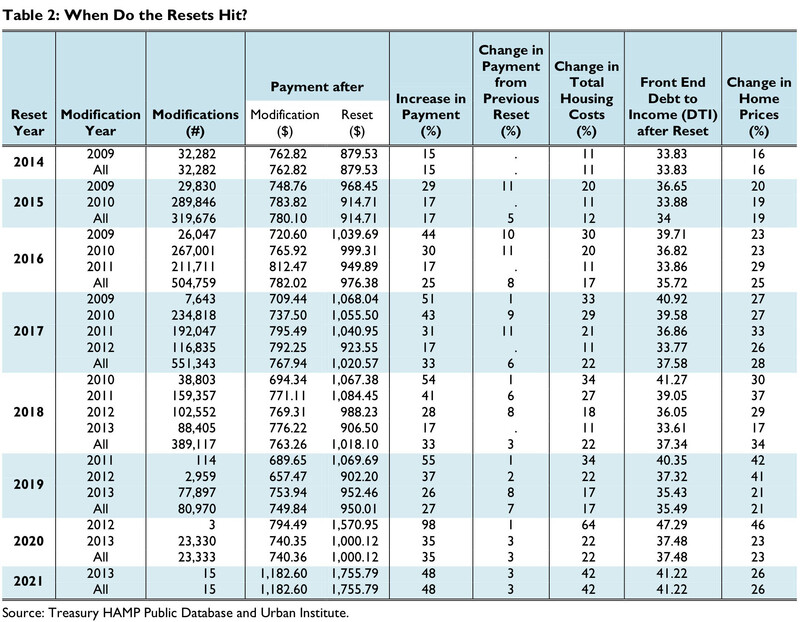 Although interest rates on 2009 modifications begin to increase in 2014, only about 33,000 HAMP modifications were performed in 2009 and the vast majority of these borrowers will find the first gradual increases manageable. As we will argue, most borrowers will be able to handle the first two payment jumps—it is the third increase that may prove problematic. Consequently, we expect that reset issues will begin to manifest themselves in 2016 (when the 2009 cohort experiences its third increase, with many loans resetting from 4 to 5 percent), and will be clear in 2017 (when the 2010 modifications experience their third increase, with many loans similarly resetting from 4 to 5 percent). We also show that fears of massive re-defaults are overblown. Using data from the private-label securities market, we find that defaults increased 15 percent when borrowers were faced with large resets. This should be regarded as an upper bound: the population is different, the HAMP resets are occurring in a healthier housing market, and the resets are gradual. So, we believe an increase of 10 percent in re-defaults is more reasonable. Moreover, we expect that there will be some further modifications at that point, which will cushion the re-defaults. We estimate 40 to 50 percent of the incremental borrowers defaulting on their modified mortgages will qualify for an alternative modification, suggesting a 5 to 6 percent increase in defaults at the reset. The impact of modification reset goes well beyond the HAMP modifications. All servicers have proprietary modification programs, and many haveemulated the blueprint for HAMP in these proprietary programs, replacing less successful programs that had been in place. Figure 1 shows the relative number of HAMP versus proprietary modifications. As can be seen, the number of proprietary modifications is considerably higher than the number of HAMP modifications. Thus, the numbers shown here, exclusively based on HAMP loans (and computed from the US Treasury's HAMP database), will understate the number of borrowers who are affected. Even so, we expect the overall impact to be relatively modest. A servicer capitalizes all arrearages, including delinquent interest payments. The new loan balance is used in steps 2 through 4 of the modification process. A servicer reduces the interest rate as low as necessary to achieve a front-end DTI of 31 percent but goes no lower than 2 percent; this rate is then fixed for the next five years. After that period, the rate will rise by 1 percent per year until it reaches its interest rate cap, which is the rate in effect when the modification was made. The mortgage rate will be fixed at this cap for the remaining loan term. If after the interest rate reduction, the borrower's front-end DTI is still greater than 31 percent, a servicer will extend the term to as long as needed to get the target DTI, but the term will not exceed 40 years. If the borrower's front-end DTI still exceeds 31 percent, the servicer will forebear as much principal as necessary to reduce the payments in order to achieve the target DTI; the forborne amount is non-interest-bearing and non-amortizing. The forborne amount is a balloon due and payable at the earliest of either: the borrower's transfer of the property, payoff of the interest-bearing unpaid principal balance (UPB), or maturity of the loan. Once the servicer has calculated the modified payments, it calculates the net present value (NPV) of the modified loan. If the NPV of the modified loan is higher than what the servicer would receive if the home were foreclosed upon (that is, the loan is "NPV positive"), then the servicer is obliged to offer the modification to the borrower. Capitalize all arrearages, as in a standard modification. If the borrower still has a front-end DTI of greater than 31 percent, then the servicer will reduce the interest rate as far as needed but no lower than 2 percent, as in a standard modification. If the borrower is still above a 31 percent front-end DTI, then the servicer will extend the term as long as 40 years, as in a standard modification. If the borrower is still above a 31 percent front-end DTI, then the servicer will forbear principal, as in a standard modification. Beginning in 2010 with the introduction of PRA, the US Treasury required servicers to apply two different NPV tests to a loan—the standard HAMP priority waterfall and PRA—and offered monetary incentives for successful modifications under both the standard waterfall and the PRA waterfall. However, even if PRA produced the higher NPV, servicers were not required to use it. Instead, the US Treasury requires that each servicer develop and implement a policy that treats all similarly situated borrowers equally when determining the circumstances under which the servicer will and will not use PRA for its HAMP-eligible loans. In June 2012, the Treasury introduced "Tier 2" evaluation for loans not backed by Fannie Mae or Freddie Mac (the Government Sponsored Enterprises (GSEs)). Tier 2 was modeled after the GSE Standard Modification program. It allows for a more flexible DTI ratio (generally greater than 10 percent, less than 55 percent7) and includes properties that are currently occupied by tenants as well as vacant properties the borrower intends to rent.8 So far, the take-up on Tier 2 has been small: out of the 1,327,287 permanent modifications started as of end-January 2014, fewer than 40,000 have been Tier 2. Out of the 933,900 permanent modifications that remain outstanding, 896,573 are Tier 1 and 37,327 are Tier 2.9 Nevertheless, the Tier 2 program is relevant to the question of whether HAMP resets will lead to increased defaults because borrowers who have missed more than three payments under the standard, or Tier 1, HAMP program are entitled to be evaluated for a Tier 2 modification. While a Tier 2 modification fixes interest rates based on the then-prevailing rate,10 the flexibility in the DTI ratio will, for some borrowers, result in a lower payment. These modifications are subject to the NPV test. The HAMP program began in 2009, so the first HAMP modifications will have their initial interest rate resets in 2014. The critical question is whether these resets are likely to jeopardize the success of the program. SIGTARP, the Special Inspector General of the Troubled Asset Relief Program, studied the impact of rate resets and found that the median payment increase, after all rate increases are completed, will be around $200 a month—from a median total monthly mortgage payment of $773 to a median monthly payment of $989. Although this fact is interesting, it alone does not tell us the likelihood of borrower re-default after these payment increases. The distribution of these 748,424 modifications with a step-up is shown in Table 1. In 2009, 32,282 step-up modifications were made, these will reset for the first time in 2014; 289,846 took place in 2010 and will reset for the first time in 2015; 211,711 were 2011 modifications that will reset for the first time in 2016; 116,835 took place in 2012 and will reset for the first time in 2017; and 88,405 were 2013 modifications that will reset for the first time in 2018. There are also a small number of 2014 modifications. It is clear from this distribution that the effects of interest rate resets in 2014 will be small, as there are relatively few resets. The years 2010 and 2011 were the two largest years for modifications, and these modifications will begin to reset in 2015 and 2016. Table 1 also shows the number of modifications that will have only one reset (rather than two, three, or four), by year. We can see from the column labeled "income of the borrower" that the borrowers who have only one or two resets generally had higher incomes at the time of modification. As a result, the interest rate did not need to be reduced to as low as 2 percent to achieve the DTI target of 31 percent. For example, for 2009 modifications, the average monthly income for borrowers who will be subject to one or two resets was $4,144 per month and $4,294 per month, respectively; it was $3,504 per month and $3,475 per month for borrowers who will be subject to three or four resets.12 For all modification years, the median borrower had his or her interest rate reduced to 2 percent as well as some term extension; however, about a quarter of the borrowers did not need to have their rate reset all the way to 2 percent and also, therefore, had no term extension. The borrowers who had their rates reduced all the way to 2 percent will undeniably face large increases in their monthly principal and interest (P&I) payment. For example, for the large 2010 cohort, the median increase in the P&I payment from start to finish is 37 percent for all 289,846 borrowers. The 22,845 borrowers who face only one increase will see their payments increase by 6 percent; the 32,183 borrowers facing two increases will see their payments increase by 16 percent; the 196,015 borrowers facing three payment increases will see payment jumps of 42 percent; and the 38,803 borrowers facing four payment increases will face the highest increase, at 54 percent. However, it is important to realize that the most relevant variable to a borrower is total housing costs (P&I plus taxes, insurance, and homeowner association dues). We find that, for the 2010 cohort, total housing costs jump by 5 percent, 12 percent, 28 percent, and 34 percent for those facing one, two, three, and four resets, respectively. Borrowers facing three and four resets will see a front-end DTI ratio of around 40 percent at the end of the reset process, assuming no income growth over the period. However, this is perhaps an unnecessarily bleak picture; the period between the initial modification and the final adjustment is eight to nine years, and assuming no income growth may be too conservative an assumption. Furthermore, home prices have already increased considerably, and assuming a home price growth of 3 percent per year, home prices would have increased between the time of modification and the final reset by 19 percent, 23 percent, 27 percent, and 30 percent, depending on how many resets take place. If a borrower is not underwater, then he or she is more apt to stretch to make his payments and may have the option to sell the property to pay off the loan, rather than default on it. Thus, while the weakest borrowers will ultimately face the largest cumulative jump in payments, the problems will manifest themselves slowly, over several years. Now let us look at the resets year by year. The results of this analysis are shown in Table 2. All 32,282 of the 2009 step-up modifications reset in 2014, the average change in P&I is 15 percent, and the average change in housing cost is 11 percent. This leaves the average front-end DTI after reset at 33.83 percent. Against a 16 percent increase in home prices since 2009, we project that there will be relatively few additional defaults. In 2015, 29,830 of the modified 2009 borrowers will experience their second payment increase. Their cumulative pay shock will be 29 percent, with a 20 percent increase in total housing costs. DTIs creep up to 36 percent. That year, the very large cohort of 2010 HAMP borrowers will receive their first payment increase, averaging 17 percent, translating to a 12 percent increase in home payments. Given the rapid increases in home prices in most areas of the country since 2010, we believe that there will be relatively few defaults on the 2010 modification vintage. The real crunch years will be 2016 and 2017. In 2016, the 2009 borrowers will have experienced 44 percent increases in P&I payments and 30 percent increases in total housing costs. The 2010 borrowers will have a 30 percent cumulative increase in P&I payments and a 20 percent increase in total housing costs. We believe that, at this point, there will be signs of an increase in defaults and this will accelerate in 2017, when the very large 2010 vintage hits its third reset. After five years, these loans reset in rate and begin to amortize their principal—a double whammy. Even when the interest rate does not increase, the move from an IO payment to fully amortizing the mortgage over a 25-year period can make a large difference in the payment. For example, assume a borrower paying a 5 percent IO rate on a $200,000 mortgage. His payment for the IO period is $830, but it is $1,164 on a 25-year amortizing mortgage. So, even with stable interest rates, these borrowers experience a pay jump of 40 percent when the loan begins to amortize. Negative amortization occurs whenever the loan payment for any period cannot cover the interest charged over that period, so that the outstanding balance of the loan actually increases over the initial period. In a typical option ARM structure, the initial payment is very low (often based on a 1 to 1.5 percent interest rate), increasing at 7.5 percent per year for the first five years. At the end of the five-year period, the payments often jump when they are reset to those of a 25-year amortizing adjustable rate mortgage. To understand borrower behavior in response to major payment shocks, we looked at the default experience of these private-label products, which were issued between 2005 and 2007. These mortgages reset between 2010 and 2012. We tabulated the percentage of loans that were current at the time of reset but seriously delinquent (greater than 90 days) within 12 months after reset. This information is contained in Table 3. 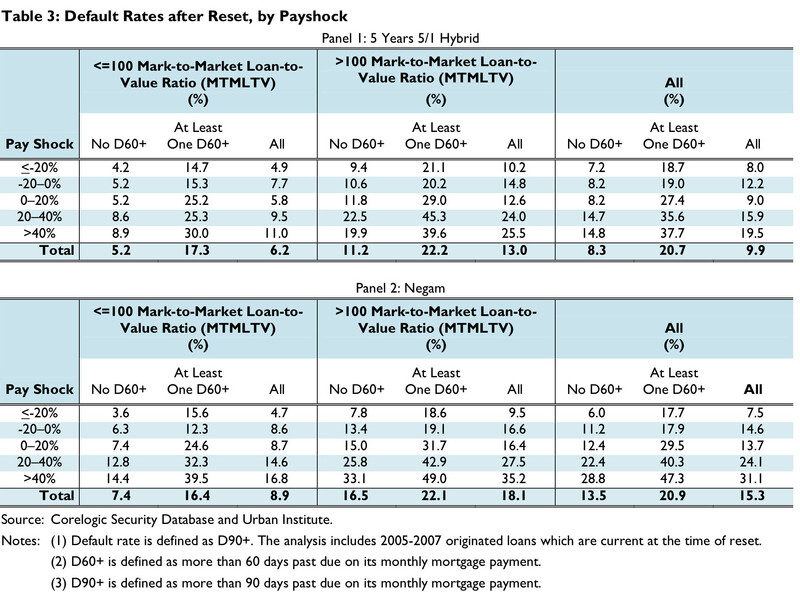 We have broken down the numbers for each of the 5/1 hybrid ARMs with five-year IOs and option ARMs into categories, depending on whether (1) the mark-to-market loan-to-value ratio (MTMLTV) at the time of reset is less than or equal to 100 LTV or greater than 100 LTV; and (2) the loans had missed more than two payments (ever more than 60 days delinquent (D60+)) in a row prior to the reset. We then combine the LTV results for our estimation, as we don't know the mark-to-market LTV of the HAMP loans at the time of reset.13 Given that we are trying to understand the default experience of modified loans (which, by definition, have already been delinquent), we believe the column labeled "at least one 60+" will be most representative. Looking first at 5/1 borrowers with five-year IO periods and at least one previous 60+, Table 3 indicates that the probability of default is 19 percent for payments reset down 0 to 20 percent; 27.4 percent for borrowers who experienced a 0 to 20 percent increase in payments. Averaging these numbers, we use 23.2 percent as the baseline default rate over the next year for borrowers who had no payment shock. Compare this figure to a 35.6 percent default rate for borrowers who had a 20 to 40 percent payment shock and a 37.7 percent default rate for borrowers with more than a 40 percent payment shock. Thus, it appears the default probability rises by about 14 percentage points (from around 23 percent to around 37 percent) for these large payment shocks. The results for the negative amortization borrowers are very similar. 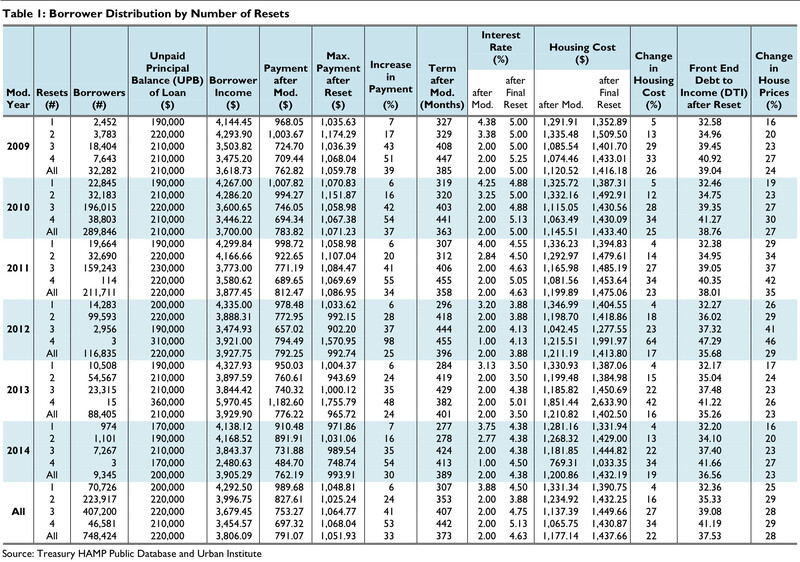 Table 3 indicates that the default rate in the year following reset, for those borrowers who had a record blemished with at least one 60+ delinquency, was 17.9 percent for borrowers who experienced a payment drop of 0 to 20 percent and 29.5 percent for those who experienced a payment increase of 0 to 20 percent; the average is 23.7 percent. Compare this figure with the 40.3 percent default rate for borrowers with payment increases of 20 to 40 percent, and 47.3 percent for those with payment increases above 40 percent. In short, the large pay shocks increase default probabilities by about 15 to 20 percentage points. These numbers should be used as upper bounds. There are four critical differences between this experience and the HAMP program. The pay shocks on the private-label securities we examine here were done all at once rather than more gradually, as is structured into the HAMP program. In this analysis, we looked at 2005 to 2007 originations after five years. These homes were more likely to have home price depreciation than appreciation. By contrast, the HAMP loans are apt to have home price appreciation between the initial modification and their HAMP resets. The nature of the reset is very different. The borrowers in HAMP know that their mortgage will reset after five years and know exactly the rates on their resets. By contrast, the borrowers in hybrid ARM and option ARM pools generally knew that they had a reset after five years but did not know the new rate or payment until they were informed of it, as the rate is based on a floating index. The profiles of the borrowers are very different. The ARM programs citied above were affordability products, with a heavy concentration in the "sand states" (California, Arizona, Nevada, and Florida). By contrast, HAMP has a broader national footprint. The ARM loans in private-label securities were generally underwritten very poorly—less than full documentation was the norm. Under the HAMP program, income is always verified and appraisals are updated. Given these considerations, 15 percent should be regarded as an upper bound. A more reasonable guess of the defaults that HAMP resets will generate might be a 10 percent additional default rate. This number will be further mitigated by additional modification actions. It is possible that some of the defaulted borrowers may be eligible for a Tier 2 modification; however, HAMP is scheduled to expire at year-end 2015, which would not help many of the borrowers likely to be affected. It is very possible the HAMP program will be extended, and reset concerns would be a possible reason for that to occur. In addition, many of these borrowers may be eligible for proprietary modifications. Out of the permanent HAMP modifications that have been disqualified to date by the top servicers, 35 percent of the borrowers have qualified for an alternative modification/payment plan and another 10 percent have paid off. One can argue that this number will be even higher for borrowers who have made their modified payments for five years. Thus, assuming that 40 to 50 percent of these borrowers will roll into an alternative modification seems reasonable, lowering the additional defaults at the reset to between 5 and 6 percent. The HAMP resets will be a challenge for many borrowers, particularly those who needed the most help and thus received the steepest discount in interest rate, but we are likely years away from a significant impact. The first of the resets, on the relatively small 2009 cohort of modifications, will occur in the fourth quarter of 2014 and are likely to be manageable. We expect the first substantial defaults to be in 2016, when the 2009 modifications experience their third reset, the 2010 modifications experience their second reset, and the 2011 modifications experience their first reset. This is likely to accelerate in 2017, when the 2009 modifications experience their fourth reset, the 2010 modifications experience their third reset, the 2011 modifications experience their second reset, and the 2012 modifications experience their first reset. The number of resets will shrink considerably in 2018 and plunge in 2019. Working from our experience with private-label resets and other factors, our best guess is a 10 percentage point increase in the default rate, with 40 to 50 percent of affected borrowers receiving an additional modification, leaving a 5 to 6 percent increase in the default rate. 1. See the SIGTARP Quarterly Report to Congress, January 29, 2014, pages 72–76. 2. Servicers are required to reduce the interest rate to as low as 2 percent, but they have the discretion to go lower. 3. The mortgage eventually resets to the Primary Mortgage Market Survey (PMMS) rate, published by Freddie Mac, in effect at the time of the modification. 4. With the introduction of HAMP Tier 2 in 2012, the "original" HAMP is now referred to as HAMP Tier 1. All borrowers affected by resets are in the original program, as HAMP Tier 2 is fixed at the market rate at the time of modification. 5. See http://www.makinghomeaffordable.gov/ programs/lower-payments/Pages/hamp.aspx for more details. 6. Servicers may develop a set of guidelines with a different target mark-to-market LTV (US Treasury incentives are provided for LTVs as low as 105 percent). Under PRA, the principal is actually forgiven in equal increments over three years; the entire amount to be forgiven is forborne at the outset of the modification. 7. Servicers have the discretion to set a different range if done as part as their overall modification guidelines. 8. All previous programs applied to owner-occupied only. 9. Out of the 1,327,387 modifications started, 1,287,317 are Tier 1 and 39,970 are Tier 2. There have been 368,514 modifications disqualified (365,987 Tier 1 and 2,527 Tier 2) and another 24,873 paid off (24,757 Tier 1 and 116 Tier 2). This leaves 933,900 active modifications (896,573 Tier 1 and 37,327 Tier 2). 10. Prior to July 1, 2014, the Tier 2 rate was set at the PMMS rate +50 bps. Effective July 1, 2014, per Supplemental Directive 14-02, the Tier 2 interest rate will be the PMMS with no premium. the interest rate below the rate in effect at the time in order to do so. Tier 2 modifications, in which the interest rate on the loan is the rate in effect at the time of modification, also do not step-up. 12. It is important to realize that a 1 percent increase is a larger percentage increase when starting from a lower rate. Also, a 1 percent increase will be a larger percentage increase on a longer-term mortgage. The below table shows the bond math for a $200,000 mortgage, 30- and 40-year initial terms. 13. We know the mark-to-market LTV of the loan at the time of modification, but that is a minimum of five years earlier. Copyright © May 2014. The Urban Institute. All rights reserved. Permission is granted for reproduction of this file, with attribution to the Urban Institute. The Urban Institute is a nonprofit, nonpartisan policy research and educational organization that examines the social, economic, and governance problems facing the nation. The views expressed are those of the authors and should not be attributed to the Urban Institute, its trustees, or its funders. The Housing Finance Policy Center's (HFPC) mission is to produce analyses and ideas that promote sound public policy, efficient markets, and access to economic opportunity in the area of housing finance. We would like to thank The Citi Foundation and The John D. and Catherine T. MacArthur Foundation for providing generous support at the leadership level to launch the Housing Finance Policy Center. Additional support was provided by the Ford Foundation and the Open Society Foundations.